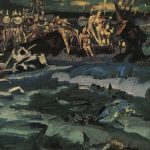 NADFAS – Hurley Books – How do you do? 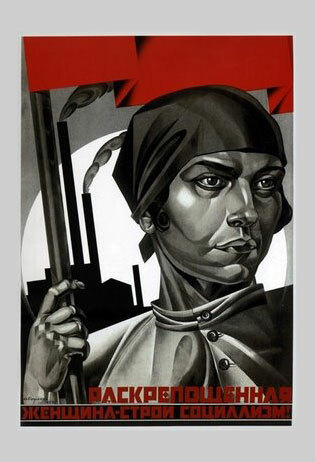 It also resulted in nauseating sycophant art such as this Social Realism. 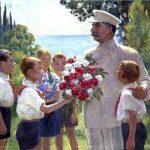 Whatever Stalin was he wasn’t an idiot he understood that art was a very persuasive way of spreading a message with ease and force, especially to a largely illiterate society. 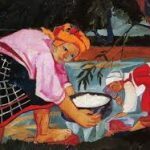 What is easy to forget is that prior to the revolution Eastern Russia was very European, all thorough their art you can see echoes of Paris, Rome, Stockholm. 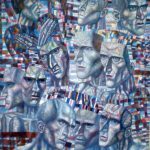 As you travel into the heart of Russia you see more art that is simply Russian inspired, two schools of art both pulling in different directions and looking to different sources for their inspiration; all lost due to cultural hegemony. 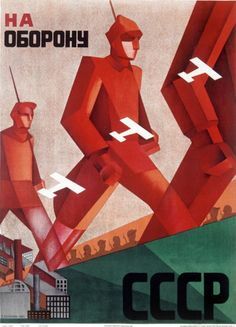 Clarke briefly discussed the artistic movements and artists that many of us may have heard of; the “Jack of Knaves” Diagliev, Malevich, Kandinsky, the Ballet Russe, generally we know these artists because they left Russia fearing the Soviet approach to art, but then we moved on to discuss who had been forgotten or suppressed. 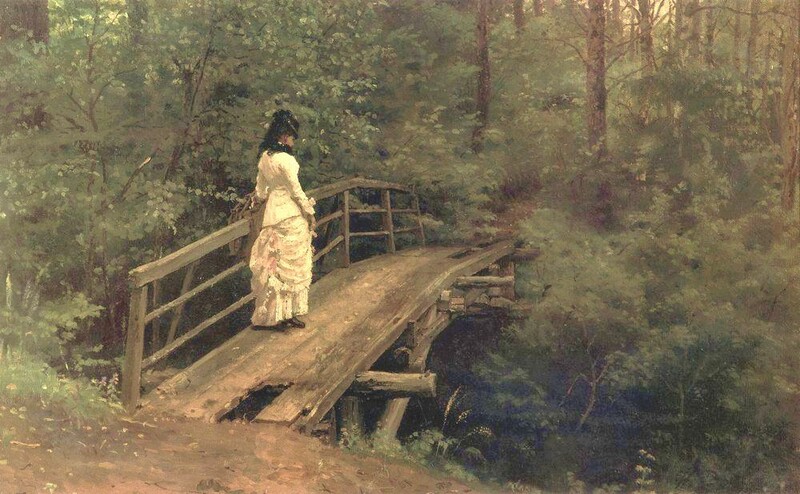 Artists like Repin and Serov clearly looked to Europe. 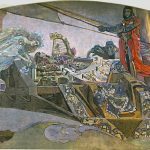 Whereas artists such as Vrubel and Goncharova had a style of art more firmly rooted in a sense of Russia, its people, religion and fairy tales. 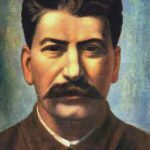 Not all artists fled or were smothered, Pavel Filonov painted this portrait of Stalin that perfectly represented social Realism and yet behind the scenes he was painting wildly avant garde painting often showing great misery. 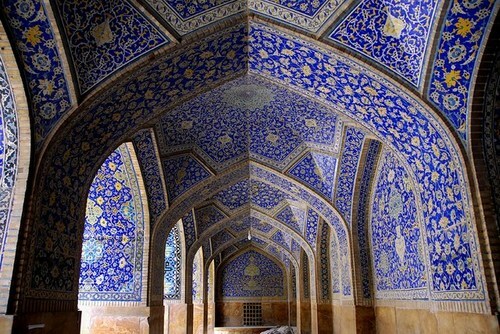 Ultimately, an incredibly talented and exciting artistic nation was suffocated and as a country was the poorer for it. I had gone to great lengths to make it to this NADFAS as I am on a mission to not miss any and despite the disappointing start to the year I was not going to let that influence me. So I changed rotas in the shop, re-booked deliveries, and left with plenty of time. Nadfas is wonderful but it’s a daytime gig and that’s difficult if you work or have small children and that’s reflected in the average age of the audience. However, if you are able to be flexible or to find a babysitter I would highly recommend visiting your local group. Anyway I parked in plenty of time, with plenty of change for the car park and headed towards the door feeling all righteous and smug. Then my phone rang, the shop was closed, my staff were sick and where did I want these beds! Ugh, 5 seconds more and I’d have switched off my phone. Ten minutes later I slid everything back into place and dashed in late again reminding myself to not be so cocky in future. 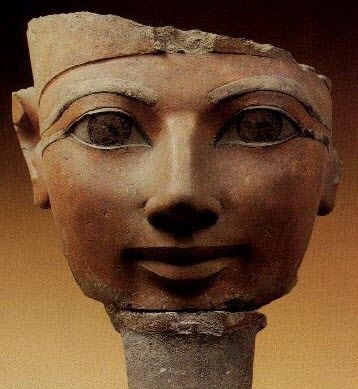 Today’s talk was about Hatshepsut by Lucia Gahlin, Egyptologist from the Petrie Museum. It was enjoyable to hear her name properly pronounced as I have always referred to her as Happy Batshit, which I’m aware is lazy and disrespectful of me. In order to set the scene the lecturer needed to stress how unusual it was to have a female ruler in Egypt and after many slides of bulls, athletes and mighty erections she rammed the point home. Egypt was a masculine culture ruled by men. Once that point was emphatically made and underlined twice we went on to discover how she had become pharaoh. This then descended into the most complicated family tree made worse by the fact that Pharaohs can have multiple wives and that sisters can marry brothers. Eventually we got to the point where Pharaoh Thutmose II had died leaving his young son, Thutmose III, from his second wife as Pharaoh, and Hatshepsut, his first wife, as regent Pharaoh. This had happened previously so there was precedence but in both cases the regent had been the uping Pharaoh’s actual mother and she stepped away from the role when the boy reached majority, and as he was Pharaoh that was pretty much whenever he wanted it to be. 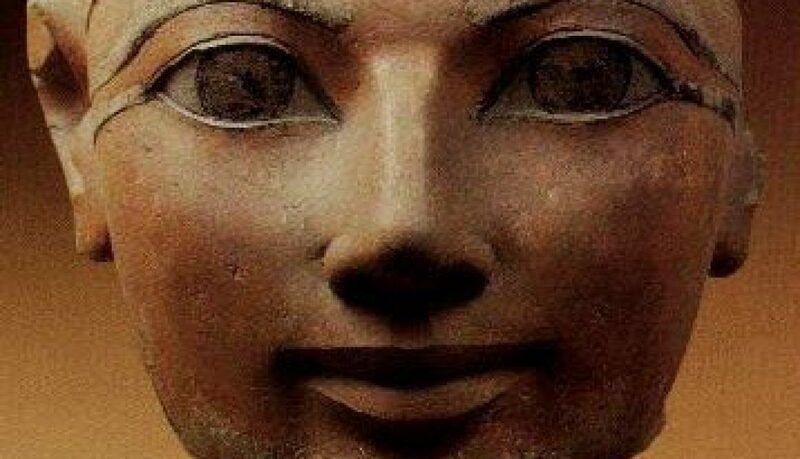 Hatshepsut was different though. She herself was the daughter of a Pharaoh, Thutmose I, was a wife of Amun, their chief God and first wife of the Pharaoh, these were powerful titles but as we have seen in a male dominated society these titles may have just been window dressing. 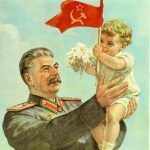 In becoming ruler she either chose to do so and out-trumped the mother, or she stepped up to the challenge as the mother didn’t want to rule. Given her subsequent rule I would say the former, she was born in power and lived in power, the death of her husband wasn’t going to prevent that but that is wild speculation based on a very cloudy glass. The physical evidence of Hatshepsut’s reign is in her buildings and the words and images upon them as well as statues of her. She is always depicted as Pharaoh alongside Thutmose III but most importantly as “first” Pharaoh. In all imagery of the pair of them she is named first and is always standing in the more powerful position. Their joint rule appears harmonious and only ended on her death. At any point before that Thutmose could have called it a day but didn’t. Again we can only speculate. Maybe she was a power hungry tyrant as some would paint her but that holds no water on close inspection. Her power was only what she was given to her by a patriarchal society, had she been a problem she would have soon been made to step down. It seems much more likely the young boy was growing up and enjoying being a teenager, total freedom, playing and fighting. 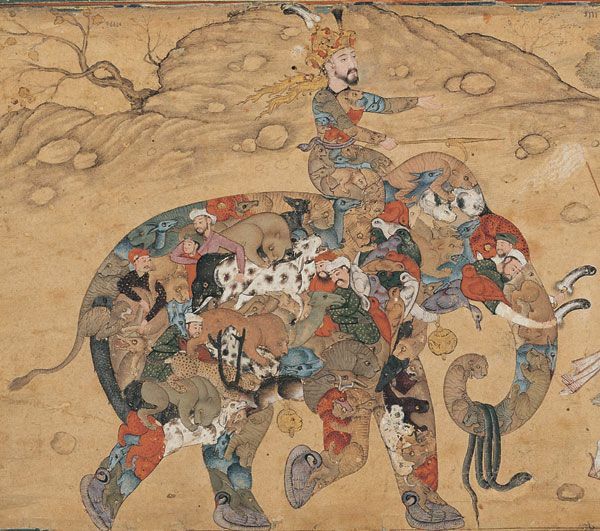 Many images depict him as an athletic warrior. Maybe he went off to battle knowing he had a damned good regent running the country, maybe he was lazy and didn’t actually want the responsibility. Again we don’t know, but what we do know is there was a time of stability and prosperity during this joint reign. We know that he was engaged in some large battles following her death and this could have been evidence of the tight lead that she kept Thutmose on. It could also be evidence that she was a great diplomat and peace keeper and without her rule enemies sought to take advantage. We can see that the earliest depictions of her as Pharaoh are clearly as female but after about 7 years she starts to look identical to Thutmose III, she is shown wearing male dress, a beard and virtually flat chested. Doubtless as she was ruing at the time she approved of this image change. This early depiction of Hatshepsut shows her in female dress with a female figure. In this later depiction she is in the male kilt, wearing the beard and is pretty flat chested. Following her death all seems fine until about 25 years later when she is suddenly and comprehensively rubbed off the wall. 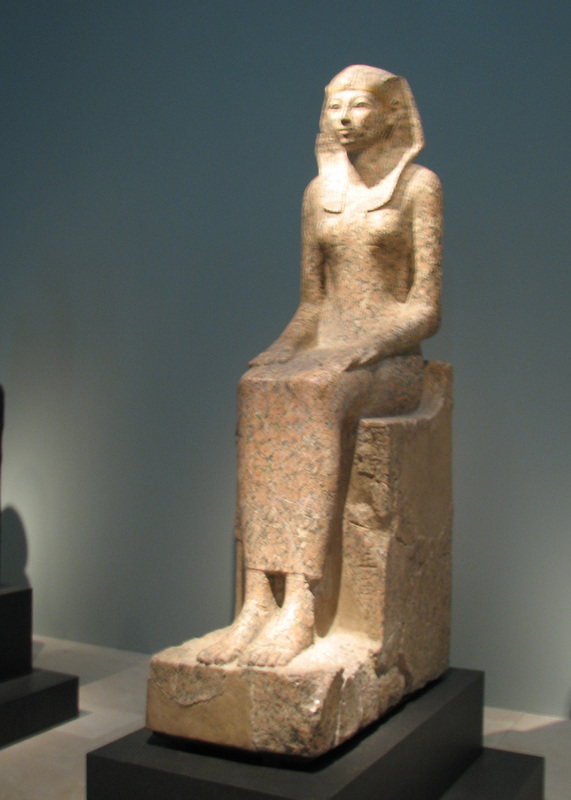 Her name and images where she was depicted as Pharaoh were chipped off, her statues were thrown into a ditch and covered over and every mention of her as a Pharaoh was removed. As a wife and daughter she remained in evidence but as a Pharaoh she was excised. 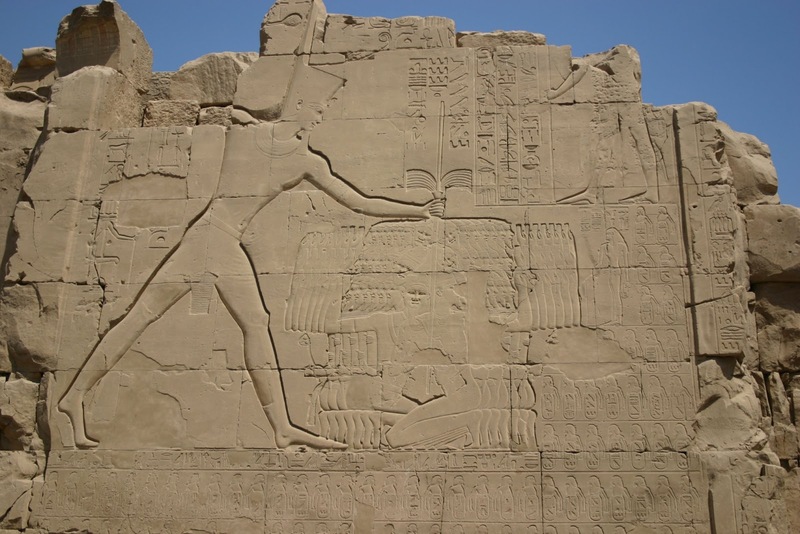 For a long time it was suggested that this was evidence to prove that she was indeed a wicked tyrant from whose tyranny Thutmose III was glad to escape. One or two years maybe but 25? That speaks to me more of an inheritance issue looming. Maybe there was a very strong wife or daughter somewhere in the background and the powers that be didn’t want her to be able to claim any sort of precedent. Maybe, Thutmose III was growing petulant and senile and wanted to rewrite history. 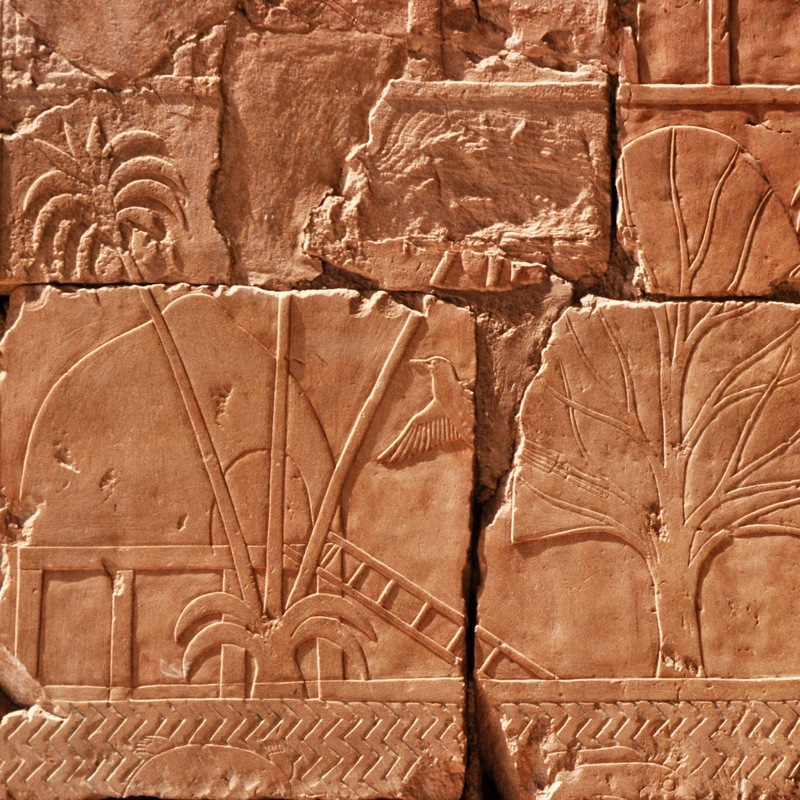 More likely the destruction came from Amenhotep II, his son. Who can tell? A hundred years ago we weren’t even aware of how powerful Hatshepsut actually was. And before we start moaning about lack of evidence let’s remember that when she came to the throne the pyramids of Giza were already 1500 years old, her country had been flourishing during all that time. 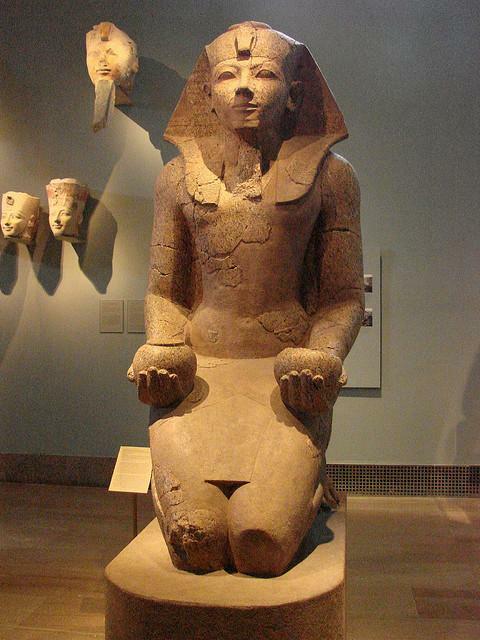 She came to the throne in c.1350BC. In Britain in this time we know that Britons lived in wooden huts, some of them built structures out of non interlacing stones and that’s pretty much it. We don’t know the name of a single person, let alone what they got up to, their history or the history of their nation. In fact the first named person living in Britain is Imanuentius mentioned by Caesar in his campaigns in 54BC. Prior to this we are a mystery and we have to rely on an invader to shed any light on us. So if we are concerned that so much of this seems sketchy and prone to speculation we are talking 3000 years ago, 25 years give or take is within certain statistical parameters. One very interesting sidebar, and there were many in the lecture, was the discussion of the land of Punt and the imagery used to portray foreigners. 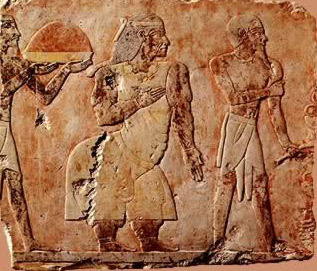 Although Egyptians appear in a very formalised way, and require name tags to denote who is being represented they were far more descriptive in their portrayal of foreigners. 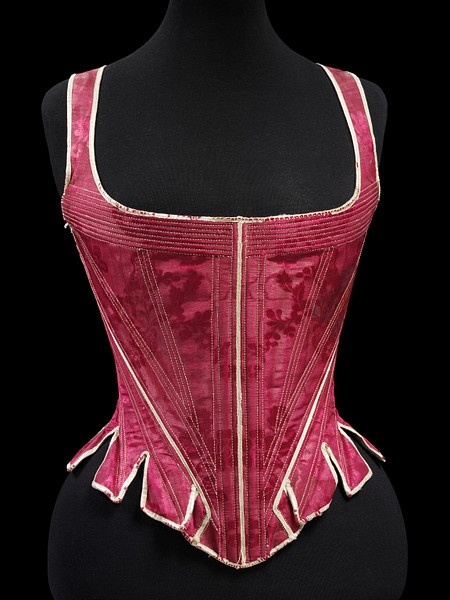 One particular portrait is the queen of Punt, she is displayed as being vastly overweight, whether this was a positive, negative or neutral message is hard to say. What we do know about Punt was that it was viewed by the Egyptians as a land of milk and honey, with great resources and was the source of their incense. Enjoyably we have no idea where Punt was. 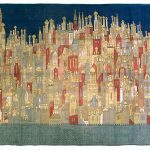 I imagine that the reason we have a culture of lost cities and and lands is because we have an actual history of lost cities and lands! Trade mission to Punt. These images show the first recorded transplantation of fauna. The residents of Punt lived in stilt houses. 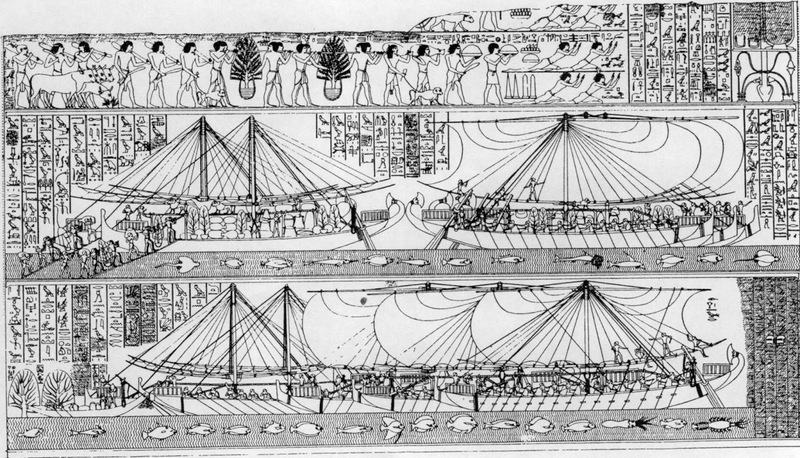 King Perahu and Queen Ati of Punt. 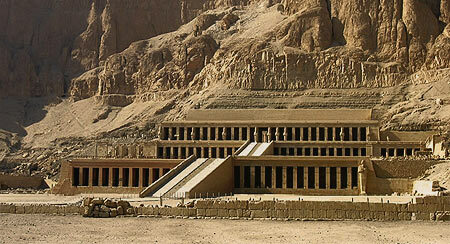 What we can say about Hatshepsut is that she reigned during a time of growth and stability. 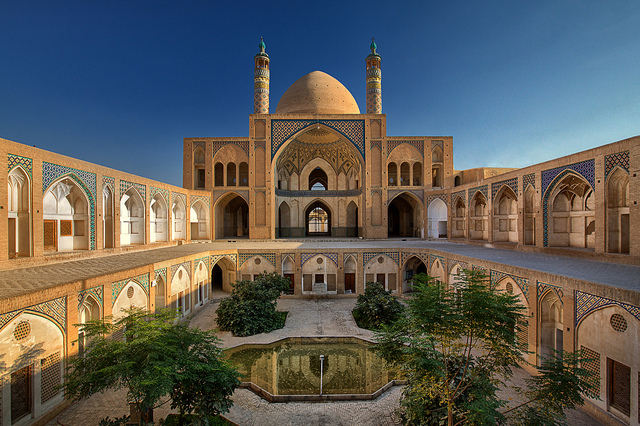 Her country was rich and stable enough to have an expansive building regime. She was clever and politically astute, she was quick to emphasise her relationship to Amun thereby engaging the support of the priests, a considerable power force in Ancient Egypt. 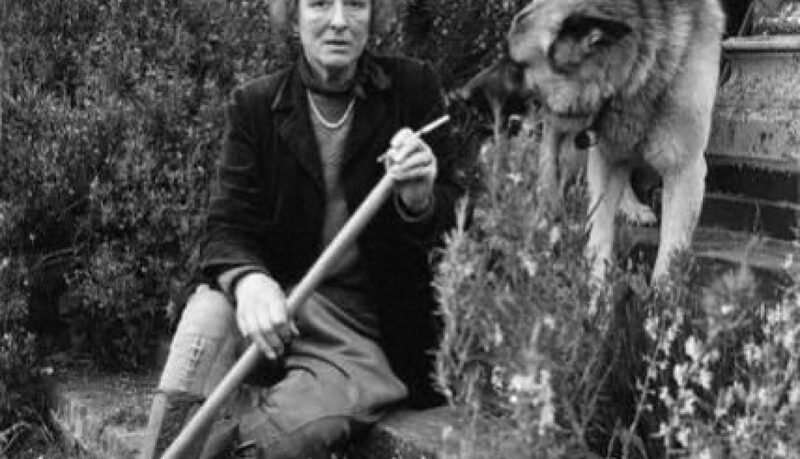 We don’t know how she died but she was believed to have been around 50 years old. We know that the relationship between her and Thutmose III was probably good as nothing was done to efface her reign until a quarter of a century had passed. I really enjoyed this lecture and have failed to mention half of what Lucia spoke of so please, if you are interested have a look at some of these links for more information. Gahlin, L. 2009. Egypt. In D. Rathbone (ed.) 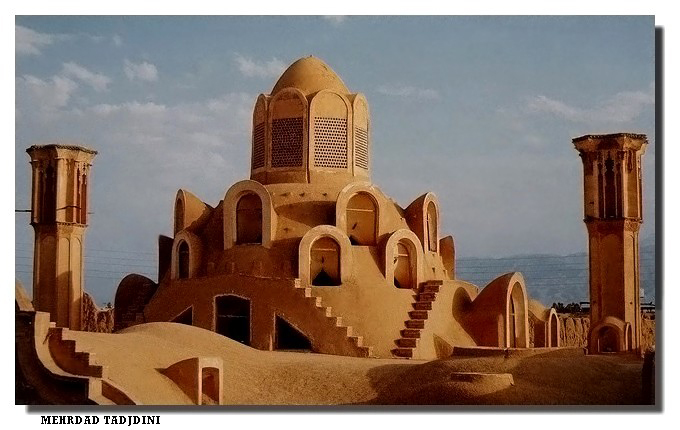 Civilisations of the Ancient World. London: Thames and Hudson. Well today’s talk started with the AGM, a mercifully brief and efficient meeting and then we were off into the talk. With regards to the AGM it’s worth me noting how much I enjoy being part of this society and appreciate all the work that the committee do to achieve it. Anyway the talk, maybe because the subject was so large or the talk time was shorter than usual this talk seemed “less” than others, nonetheless it was still interesting. 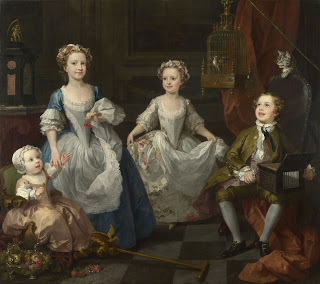 Through a range of portraits that neither started with Hogarth nor ended with Hockney we looked at the progression of the mainstream British portrait, although not everyone was British. To see the paintings better click on them. 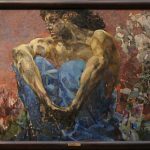 Each link will take you to a larger picture and a far more detailed discussion of the painter and painting. Initially we discussed the honesty of a portrait. 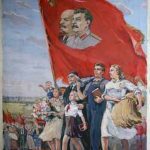 Portraits were usually commissioned by the wealthy and the powerful and as we have no photographic sources we have to rely on the fact that certain licences may have been taken. The more powerful the sitter the more likely they dictate the reality of the image. As the power shifts towards the fame of the painter they can insist on their own interpretation of the sitter. 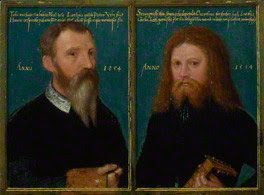 We started with the first known British self portrait in oil, 1554 by Gerlach Flicke featuring himself and Strangwish. 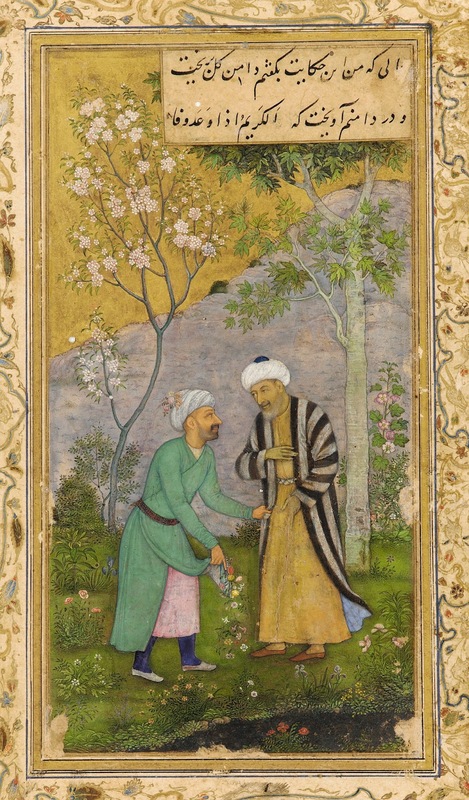 It was done in prison, and details a friendship between the two men. Flicke was a portraitist but was in prison for his support of the Wyatt rebellion. Strangwish was a gentleman privateer and had stepped over the line. The most striking thing about the portrait is the size, at 11cm by 8cm it’s tiny. The second interesting fact is that the writing over the German, Flicke is in Latin, the writing above Strangwish is English, possibly suggesting a hierarchy of language and importance. 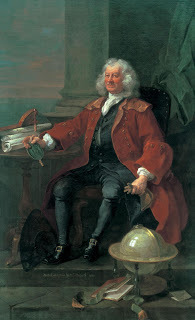 Moving on to Hogarth we are in full English ascendency in fact Hogarth was almost xenophobic in his love of Britain. In his self portrait we see his books are by Shakespeare, Swift and Milton. His dog features heavily being in the foreground and almost the same size. We also see his line of beauty and grace depicted on a palette, this sweeping line is apparent throughout all his portraits. Onto his portrait of Captain Coran we again see the superfluous sweeping line in the line of his collar. Coran was a great figure in British society and Hogarth has raised him above the viewer giving him greater presence over us. 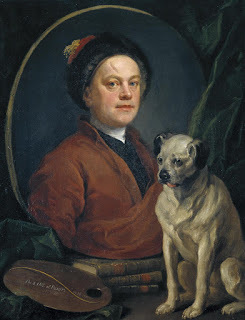 Hogarth writes in English rather than latin in the picture again underlining his love of all thing English. There is always humour in Hogarth, this time it is in the grand majestic setting, the seal of office, the classical columns, the throne like arrangement and sitting magnificently in the middle is a rather scruffy hap hazard man. It is not mocking him rather it suggests that the honest man is to be upheld not airbrushed. 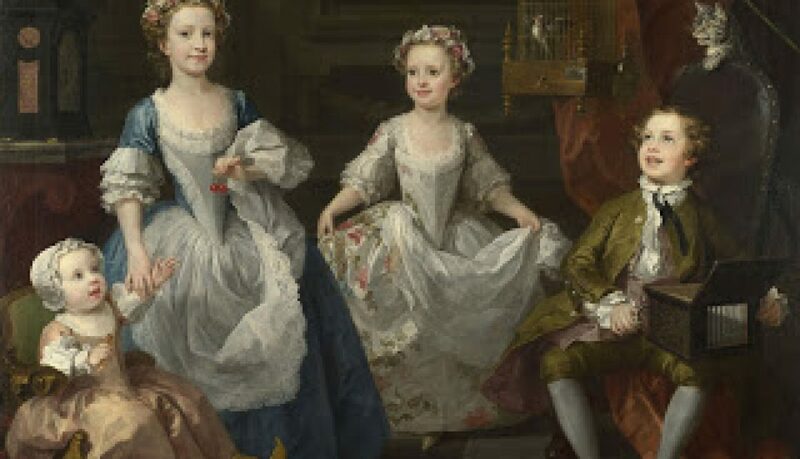 His third portrait was well known to me as the smiling cat but better known as the Graham Children. There are so many things to see in this paining but the one I like focusses on the cat. The boy is smiling up at the goldfinch no doubt believing it is his playing that is making the bird cheep but we can see that in fact it’s the cat above. The boy and the cat also have the same expression. But the last joke that Hogarth wants to make is to make us see what is going to happen next. The latch on the birdcage is undone, any second now the cat will pounce, the bird will flees and this perfect scene will descend into chaos. Incidentally the line of beauty in this portrait is depicted in the white apron pulled up and swept over the blue girl’s arm; a very deliberate arrangement. Vivien was at pains to point out that portrait artists love to tell to stories about the sitters in the scene, painting are full of clues and allegories. 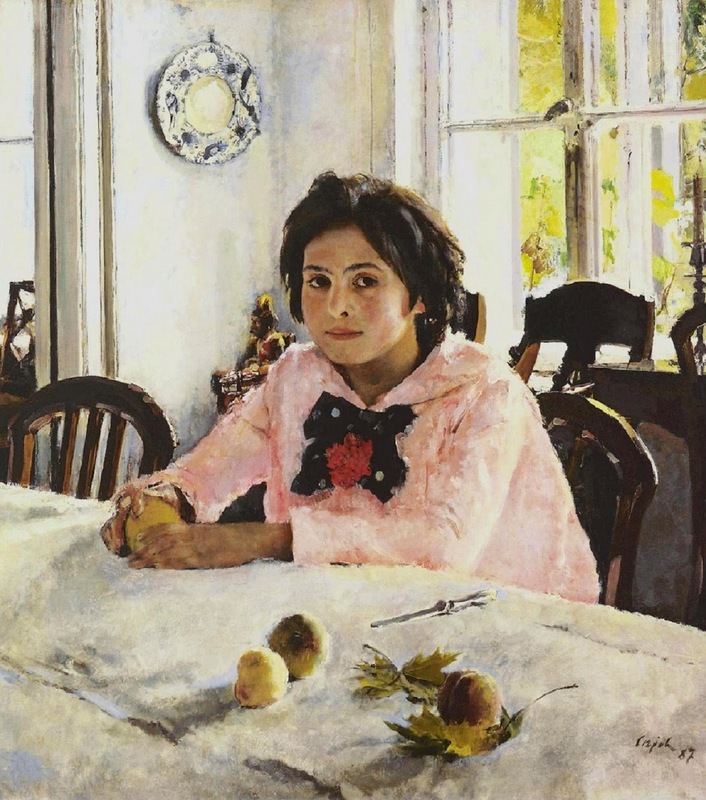 You will always learn more about the sitter by looking in the background and the objects placed around them. Next we compared Thomas Gainsborough and Joshua Reynolds, Reynolds was the Court painter and was in such demand that he normally just did the face with the rest of his workshop finishing his work.. He’s also considered by some to not be as good as Gainsborough, he struggled to capture a likeness and the paint that he used often cracked and often has to be conserved, Vivien was saying that an art restorer she knew has never had to restore a Gainsborough but regularly restores Reynolds. 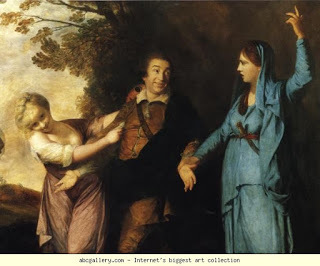 The two following paintings are of the same man David Garrick, Gainsborough’s portrait 1770 is a very intimate friendly confiding picture. 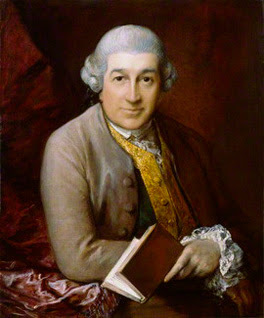 Reynolds painting, 1760 is of a far wider scope and as we can see from the two pieces the face isn’t quite the same. I know who I’d choose to paint me! 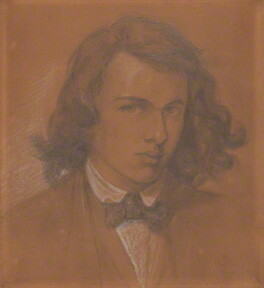 Jumping forward we get to Gabriel Dante Rossetti and his self portrait in 1847. 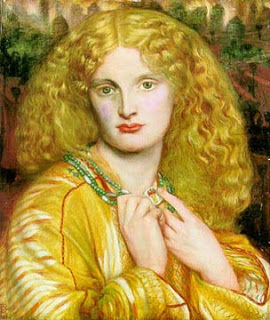 Rossetti wasn’t considered to be a great draughtsman so got around this by pretty much filing up his canvas with the sitter. In his own image he leaves the background blank, in the one of Annie Miller her gorgeous textures fill the space. 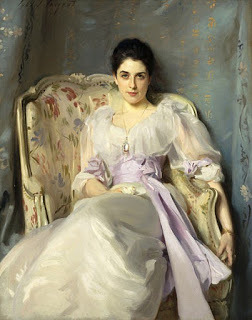 The romanticism of the mid eighteenth century was rampant amongst the Pre Raphaelites and have a look at the beauty of Lady Agnew by Singer Sargent, 1892 From the look of her she rather liked Sargent, it’s a very louche portrait with the sitter off centre and very relaxed. Have a look at her skin through her muslin sleeve, so translucent. 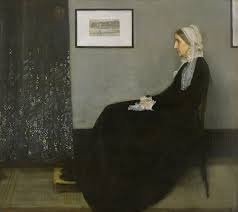 From the pure romances we get to Whistler and his mother in 1871. 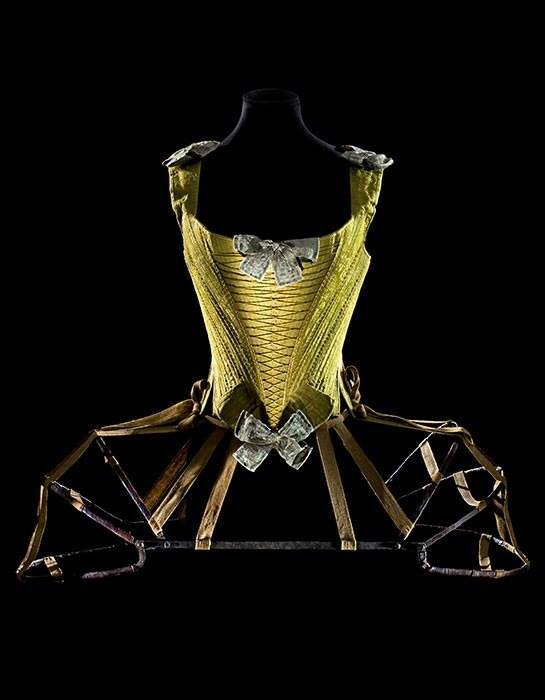 This painting in its simple palette of colours and angles makes us remember that photography was on the rise. 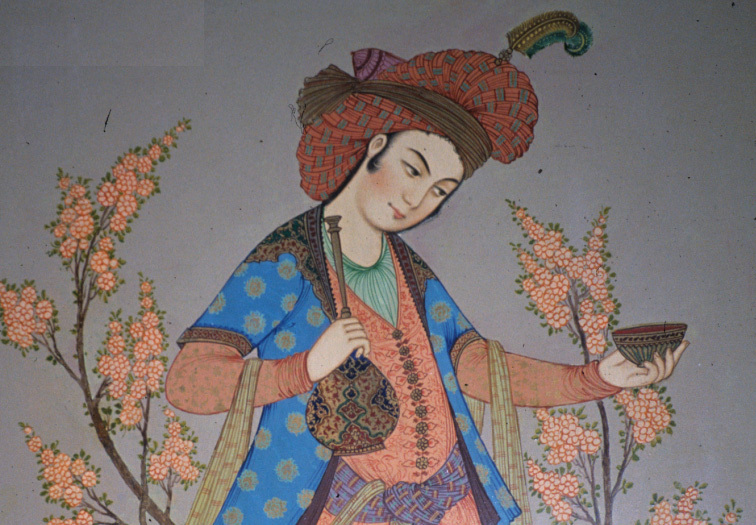 Artists were also beginning to show portraits that told of everyday life. 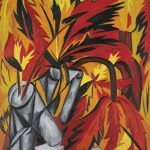 Now artists were become more common as more people hung art in their homes. 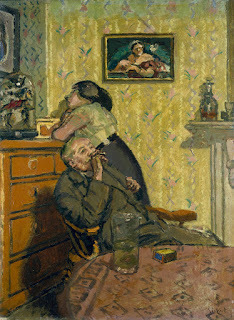 Sickert has done a lovely painting of a married couple called Ennui. Everything about the picture suggests how fed up the wife is of her life and how complacent the husband is about his. Clearly this wasn’t a commission but an artist beginning to paint to sell to whoever would buy his work. Art was becoming more commercial. We are also starting to see the rise of female artists, Laura Knight has done this wonderful portrait and self portrait in 1913. 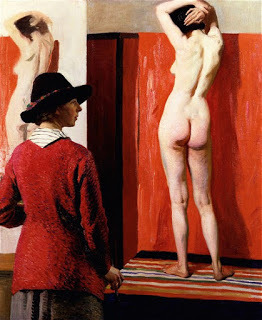 She has her back to us, her sitter has her back to us and is naked and then the painting itself also shows the back. Three women all with their backs to the viewer. I love this picture, it’s so “so what!” but look how she draws attention to her tiny half profiled face. Despite it taking up very little space on the canvas we notice it instantly because it is set against white space and pops out. Just as a nice little touch she bought that cardigan at Penzance market. And then portraits can be scorching. 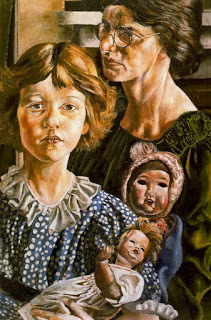 This is Stanley Spencer’s portrait of his wife and daughter. You won’t be surprised to discover that he painted this after he left them to set up house with a woman that he thought he loved and loved him too but in turn turned out to be a lesbian only after his money. It’s hard to tell who is more hurt and let down, the family or the dolls. 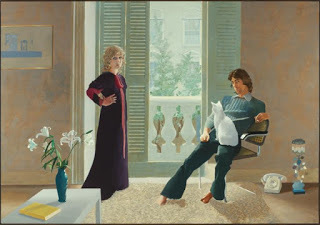 More pain shows through Hockney’s portrait of The Clarks and Percy (Ozzie Clark and Celia Birtwell) in 1970having just wed. Hockney was their best man, clearly he could see what they couldn’t and they were divorced by the end of the year. 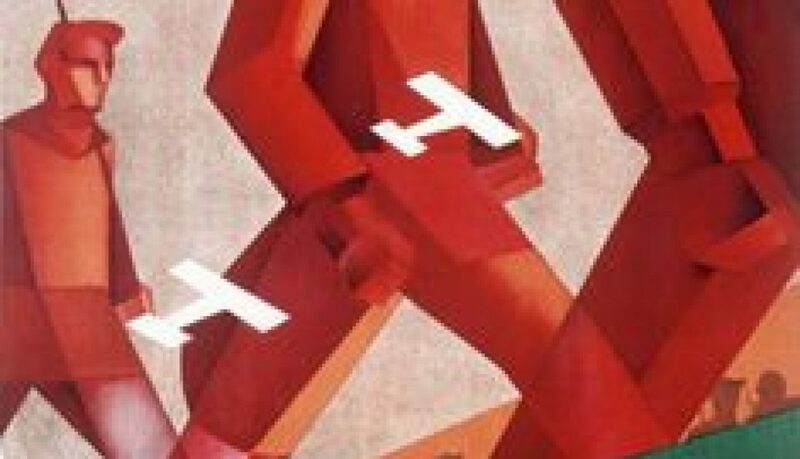 Incidentally if Ozzie Clark’s feet look awkward its because Hockney couldn’t do feet so he hid them in the shag pile. From one Hodgkin to another. 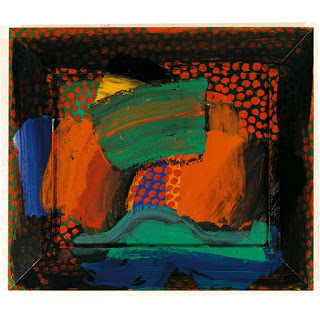 The first is by Howard Hodgkin and is a picture of Patrick in Italy, 1993. Doesn’t he look, happy? Er? 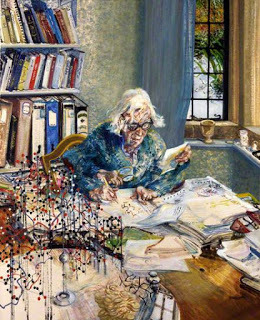 The second is a picture of Dorothy Hodgkin by Maggi Hambling 1985. A brilliant study of a brilliant scientist and look how busy, she has four arms. Finally we come full circle to commission portraits. 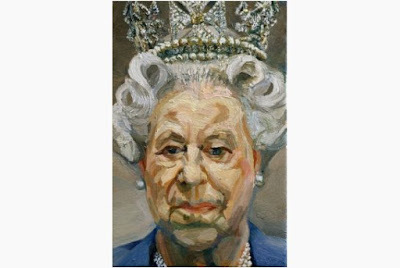 This time we have one of the UK’s most famous and respected artists Lucien Freud painting the Queen, the nation’s pre-eminent figure. So what happens now; is it about the power of the sitter or the power of the artist? There were six years of negotiation before this portrait occurred, even more telling was that the Queen allowed 22 sittings when she normally only gives three. 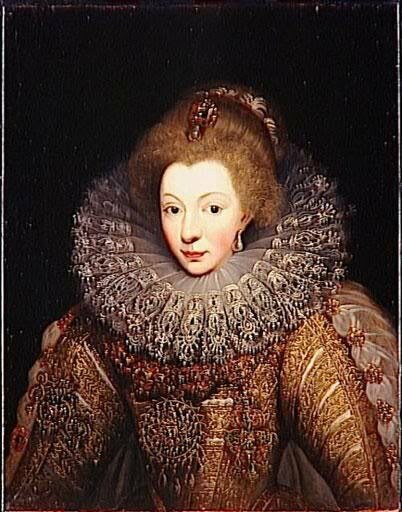 The resulting portrait was hated by many but I imagine the Queen rather liked it. She has no need of false flattery and strikes me as a rather down to earth lady. Despite the crown. So another whistle stop summation. To get a real flavour for the talks find your local NADFAS and enrol. 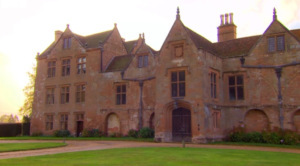 The Elizabethan and Jacobean Country House – Dr David Bostwick. Finally arrived in good time, with my glasses and without interruption. So far, so good. Our speaker arrived and I was thrilled to see that he was a total dandy. 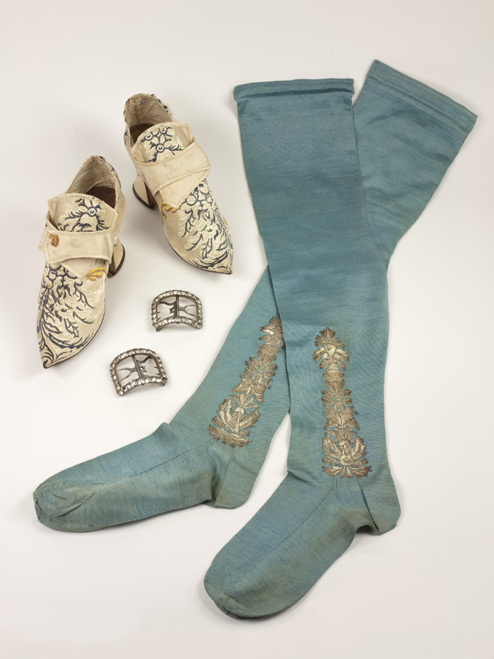 Blue suede brogues with red laces, bright pink socks and a pale pink pocket ‘kerchief. Brick coloured trousers, a checked shirt and a pin striped blazer, topped off with a spotted tie and horn rimmed glasses. It was a magnificent display of confidence and style. I figured that the following talk was going to be entertaining. And then we were off. Dr Bostwick was not just knowledgeable but also enthusiastic as well as rather eclectic and we rushed through staircases, hallways and chimneys. Front doors and windows stood open before our whirlwind tour of the shift in 16th century architecture. 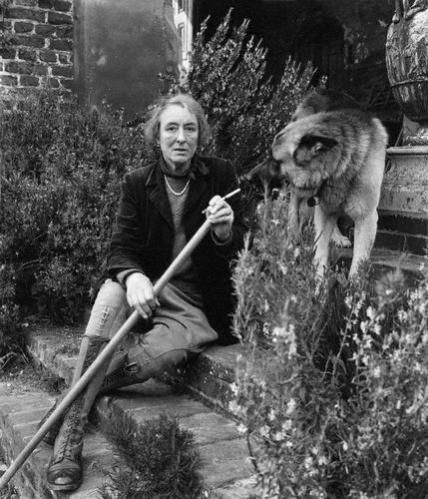 He spoke about Bess Hardwick as though she was an old friend and all the while he delivered his knowing commentary in an accent that brought Alan Bennett to mind. 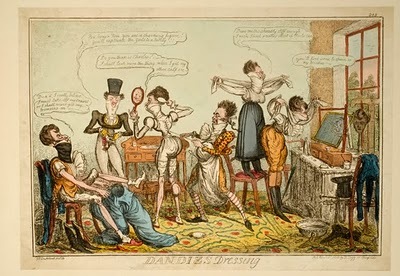 It felt familiar and gossipy and very entertaining indeed; it also turned out to be very educational. 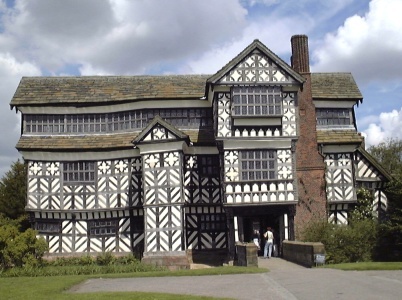 Little Moreton Hall was built in stages but was finalised to look how we see it today around 1560. 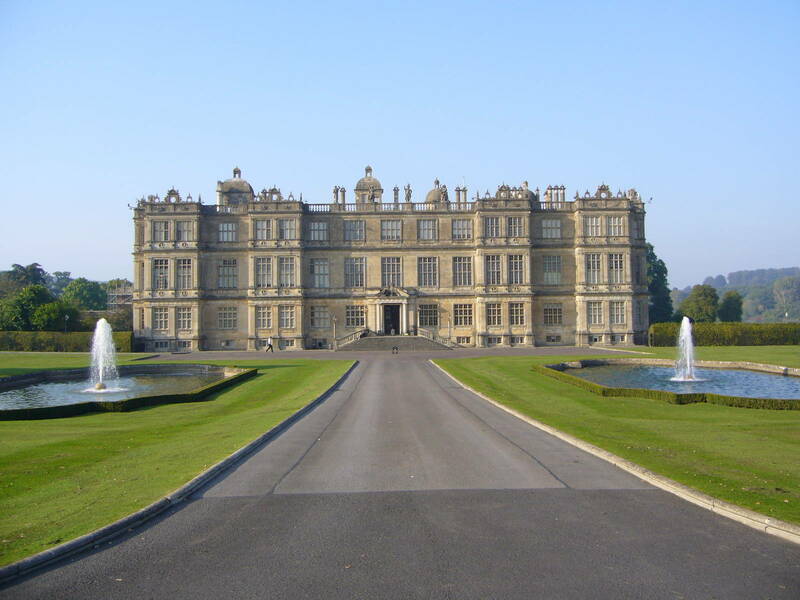 Compare that to Longleat Hall which was completed in in 1580, only twenty years apart and yet they look like they come from different centuries. Out with the old and in with the new. Architecturally, this was a time a massive developments. There was a hell of a lot of stuff discussed but the following caught my attention. The main door. 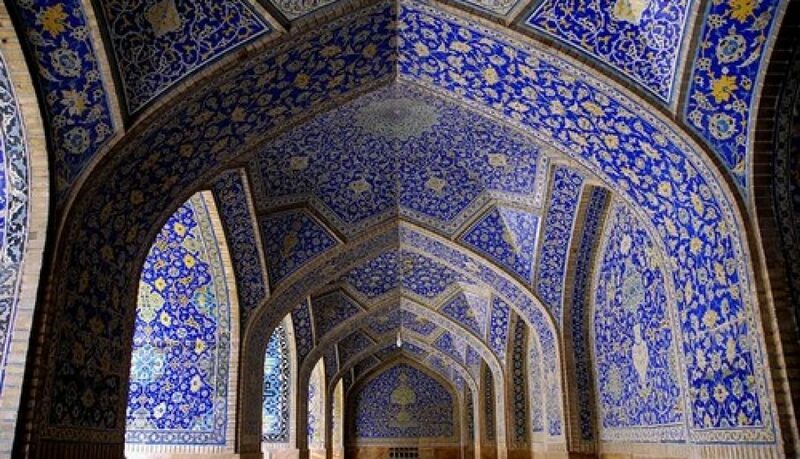 Rather like a church, you would enter a home at one end and progress to the other. The grander the house, you would climb a staircase to the main floor upstairs. By traversing the hall you had a sense of procession and a chance to view the wealth of the house as you approached your hosts. Over the decades though builders began to employ a symmetrical look to the front of the house but had to contend with the fact that the main door was deeply off kilter. A wide range trompe l’oils were employed to try to balance things up. Francis Bacon believed houses were to be lived in rather than looked on and didn’t consider the issue important. in the centre of the house and the hallway running through the middle of the house towards a grand staircase at the rear where guests then walked up to the main hall upstairs. 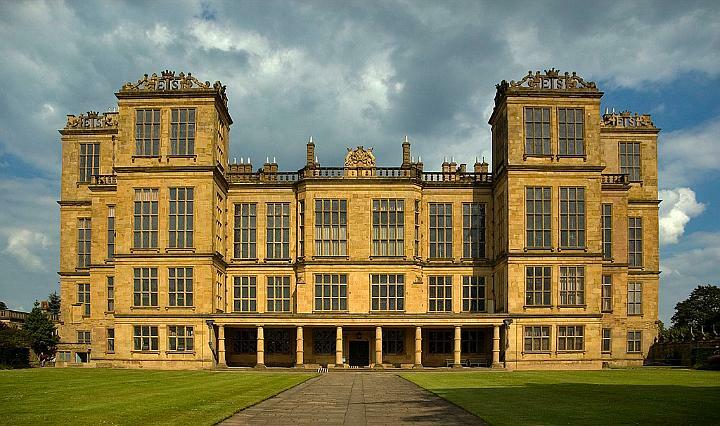 This hall was so grand that Hardwick Hall was called more glass than brick. 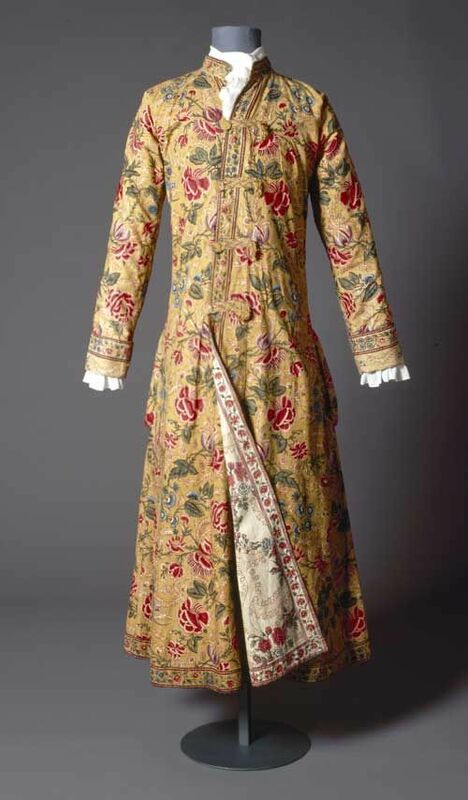 It was also so cold in winter that Bess had five sets of curtains on every window and found the main hall intolerably hot in summer. Thankfully the reception floor was only for entertaining, the family lived on the other floors that were far more hospitable. 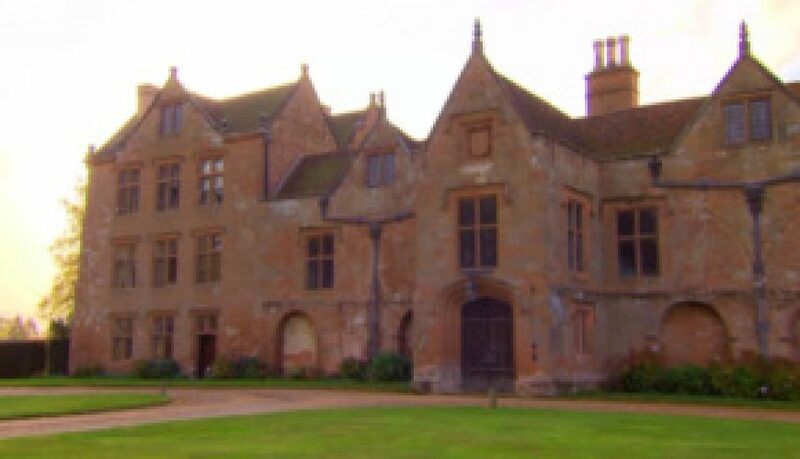 Unfortunately a more recent resident of Hardwick wasn’t as wise as Bess and tried to live mainly on the grand entertaining floor. Eventually he too fled to the other floors. 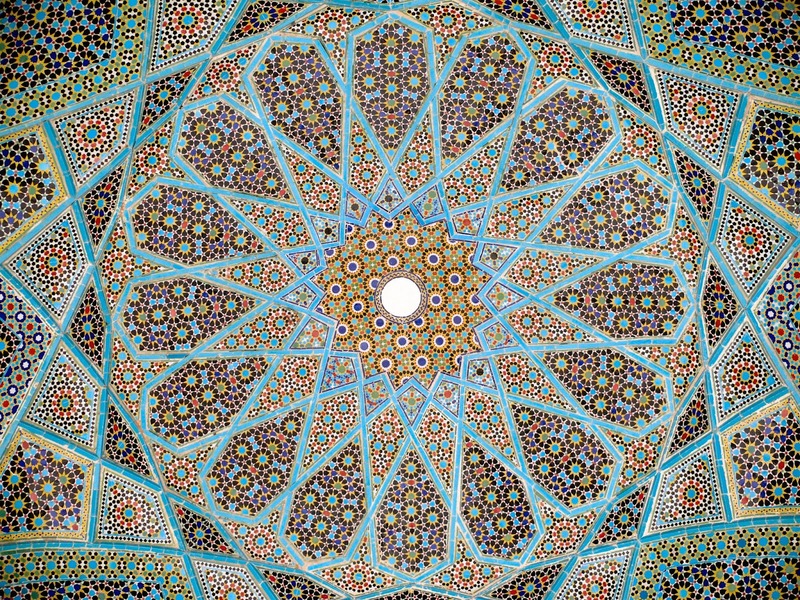 So that was symmetry taken care of. Then there was the start of perpendicular architecture. Obviously castles went up but most homes sprawled and grew sideways, tacking bits on here and there. With the inclination for symmetry the houses began to rise. The first obvious rise was the heraldic crests above doorways. First the family crest. Then a local Lord’s or another family crest and finally at the top the royal crest, if you were very grand. After crests we had columns. Corinthian, topped by Ionian, topped by Doric. A reversal in importance over the family crests. Then windows began to conform to the sense of rising grandeur. I also loved demonstrations of how our language has developed. In the serving hall cups were placed on a side board for servants to fill and distribute. This was the Cup Board. 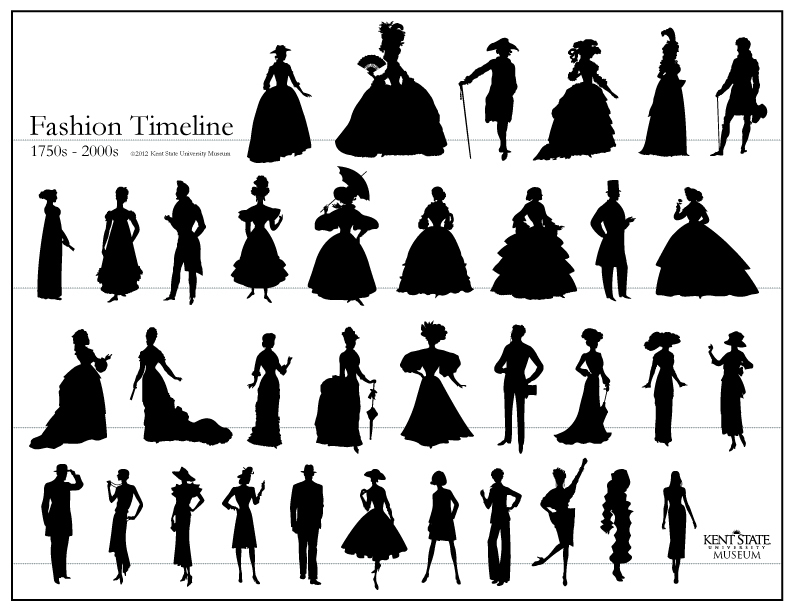 A collection of dinner plates or where everyone dined together was called a mess. Bread was kept in the Pantry (pain try) Buttery (Bouteille) is where the bottles are kept. A lot of our “Dignified” language comes from the French and our down to earth language is Saxon. For example: animals as livestock is Saxon; pig / sheep / cow. But animals as food is from the French, pork / mutton / beef. 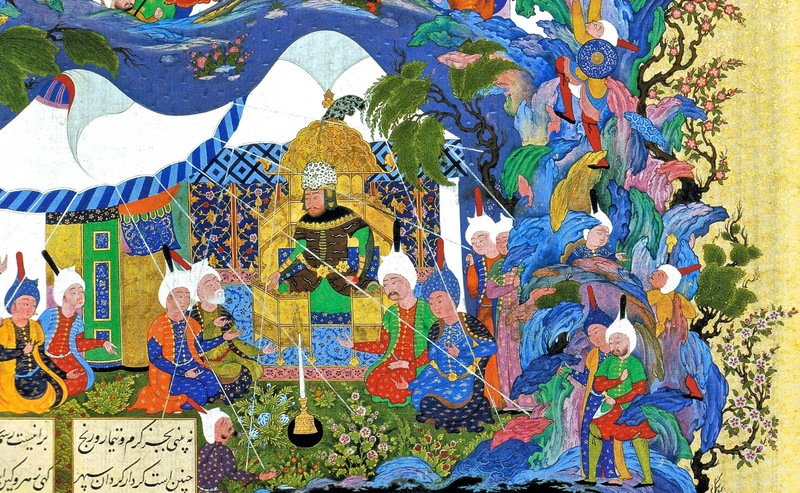 Finally, here is a very evocative piece of writing describing a female scholar and her chamber. 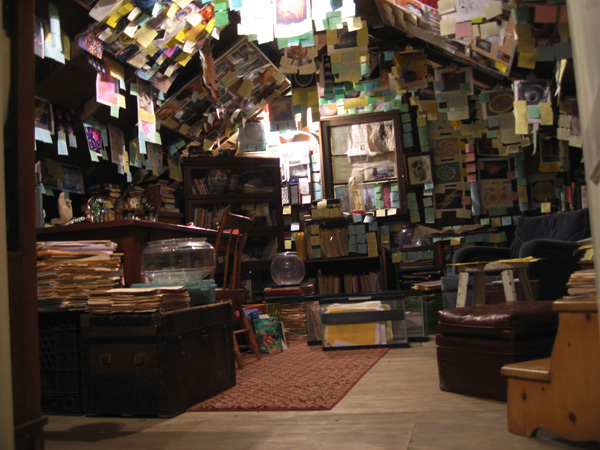 Sadly there are no pictures of her room but maybe it was a bit like this? So, a whistle stop tour and the bits and bobs that I got out of it.